If I was in Los Angeles, and not in the middle of Walsall, I’d have seen a rather cool innovation from JLR (Jaguar Land Rover). It’s called justDrive and it’s not just built into their cars – this is an app that is available for Android and iPhone. Once you have the app on your smartphone, just plug into the USB port in the car – but it’s not just receiving a charge – this is talking to the vehicle over both Bluetooth and that USB port. Before you head out you can get the weather, news and traffic information, then you can touch the screen or talk to the system to communicate with the system. Now, what all that means (as you’ll see in the video below) is that you can say things like “Text my wife my location” and she’ll get your position. You can also say things like “Text my wife” and then perhaps say “How about we go out for dinner?” Text replies will then be read out to you through the car speakers, then you can perhaps ask the system to put some music on so you have something to listen to. It’s basically making the car clever, and using your phone to communicate with the outside world. Using the underlying JLR InControl software, this will be available on all 2015 models from their range and those apps will be available shortly. Popular apps and services like Twitter and Spotify are also integrated. LOS ANGELES – Jaguar Land Rover has announced the launch of ‘justDrive’, an industry-leading app technology that integrates multiple smartphone apps into a single, voice-activated in-car experience. Developed by Silicon Valley-based CloudCar™, Jaguar Land Rover has optimized justDrive for its InControl™platform for both Apple iOS8 and Android phones. ‘justDrive for Jaguar Land Rover’ integrates popular apps and services, such as Spotify, Twitter, Yelp and others, to give Jaguar and Land Rover drivers an unprecedented level of connectivity for navigation, media, social interaction, voice search and information services while minimising driver distraction. justDrive will join 17 other apps including Stitcher, IheartRadio and Parkopedia currently in Jaguar Land Rover’s InControl Apps in-car infotainment system. Free to download, justDrive is available from early 2015 and offers drivers continuously updated apps and services throughout their vehicle ownership. Dr Wolfgang Epple, Director of Research and Technology, Jaguar Land Rover, said: “Our InControl system already allows the driver to plug their smartphone into the vehicle and then safely control their apps through the vehicle’s touchscreen. 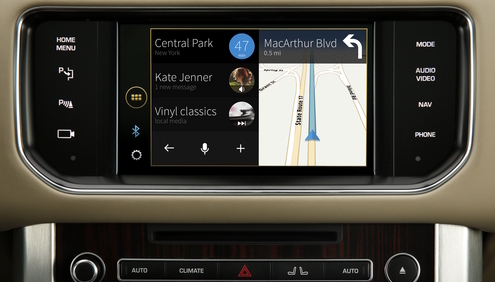 The apps are enhanced for in-car use, so it is exactly like having your smartphone installed in your dashboard. justDrive uses one of the most advanced plain speech recognition packages in the world, so customers can communicate naturally with their car, rather than using simple syntax commands. justDrive’s intelligence takes care of finding the best results for a user’s request from among the many applications and services that it has aggregated. So instead of the driver having to specify which navigation provider to search for when looking for the closest gas station, they can simply ask justDrive for directions. The driver can dictate and then send a tweet or SMS by simply saying: ‘Tell George I’ll be late’, with justDrive reading the content of the message back to you before it is sent. You can also ask justDrive to play a particular song, just by asking for it. To support the development of other future innovative infotainment technologies, Jaguar Land Rover has opened its first overseas R&D facility in Portland, Oregon. The $3m (£2m) Open Software Technology Center will focus on the development and application of advanced connected technologies and will help lead the development of future Jaguar and Land Rover infotainment systems. The 15,000 sq.ft facility features a multimedia creative suite, innovation spaces, a development laboratory and a six-bay vehicle workshop. It employs a team of around 30 infotainment specialists, including 16 highly experienced software engineers. Cortana puts this guy in a spin.